Gorgeous. Yesterday I bought some small sugar pumpkins with a similar intention. 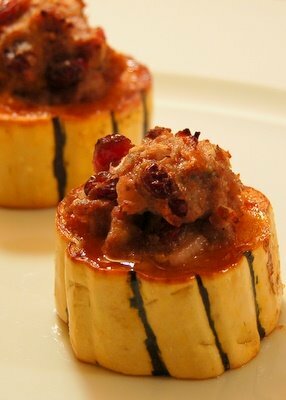 I plan to do them stuffed with sausage, Israeli couscous and cranberries, among other things. But I love the look of the delicata. it made me hungry just by looking at it. I'll try make one, maybe this coming weekend wish me luck!! good luck with that delicata. Let me know how it comes out. What a perfect fall recipe! Looks delicious and relatively easy! That really looked so delicious. It seems to be a simple recipe. I think I am going to make one. Thanks for the recipe. I love the look of these and made a variation of them for Thanksgiving. They were a big hit. Happy Thanksgiving! Glad you liked the stuffed delicata. I made this earlier this week. It was so delicious! Thanks for sharing.